This morning I set out to add the Federally Endangered Black-capped Vireo to my life list. Only once before have I seen this species and that was in Big Bend NP. My destination was the Kerr Wildlife Management Area, north of Concan, Texas about 70 miles. 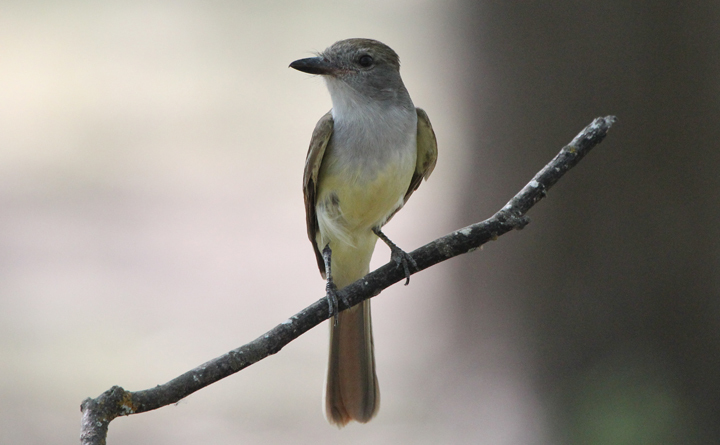 Along the way I stopped at Lost Maples State Natural Area to try for the Acadian Flycatcher. Last night I ran into the young Russell Cannings, who set the British Columbia Big Year record last year, at Neal’s. He had given me directions for a singing bird on territory along the East Trail in Lost Maples. Though there was a slight drizzle all the birds were singing up a storm. Boy it’s nice and easy when they’re singing! I had the bird in less than twenty minutes and continued on my way to Kerr Wildlife Area. Black-capped Vireos appear to be faring pretty well at Kerr. Prescribed burns and cowbird eradication programs have helped increase the population. So the trick isn’t to hear them, but to actually see them. They’re secretive rascals and stay concealed much of the time. Jon Dunn had suggested locating smaller thickets surrounded by grassy areas and then just be patient. This was valuable advice and after about 1/2 an hour of work. I was able to get a good look at a singing male. After actually working this afternoon, I drove over to the Neal’s Lodge Pecan Grove and staked out the drip. My efforts were rewarded with this Brown-crested Flycatcher, the third new Year-bird of the day. Tomorrow is a travel day as I will drive west to Big Bend Country, climaxed by the hike on Thursday up into the Chisos Mtns. for the Colima Warbler. Hey John, say hello to Big Bend for me. If you still need Pallid Bat for your quest to 1000 let me know and I can give you a spot to try. of days ago in Onrario. The same storm brought Neotropical Cormorant. I messed up. Hi John! Looks like things are going well! Good luck in Big Bend. Oh yes, my friend Barb in Victoria would be happy to help you with Skylarks if you decide to go up that way. Please forward your email address and I’ll forward hers. Mine is deacamp1@gmail.com . I need Pallid Bat. What do you have? I’ll e-mail you off line. Thanks.